Pamela Proctor is on tour again. This fall she will be travelling through the province talking with educators and parents of young children about her experience with innovative, flexible, child-centred approaches to learning. 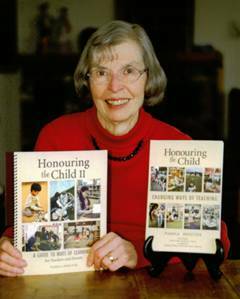 In response to request from users of her first book – Honouring the Child, Changing Ways of Teaching – Pam recently produced a handbook for teachers and parents with practical information about setting up and implementing individual learning plans. For me, Pam is a great role model. She is passionate about child-centred learning, believes in the value of her own experiences and committed herself to writing a book to share her experience and knowledge. I am grateful that she (and her husband John) are travelling the province to “spread the word”. The children will appreciate it too! This entry was posted in Uncategorized and tagged Book Tour, Education, Student-centred learning by Margo. Bookmark the permalink.